The flight from Cape Town was the day after we arrived, giving us a chance to rest from the long journey before continuing on. Transit to and from Cape Town's city center by bus is really easy so we utilized that, then took our short and pleasant flight to Walvis Bay. Air Namibia was a nice airline. They provided on-time departure and arrival, friendly service, a decent in-flight snack (even had a vegetarian option!) and a comfortable plane. Walvis Bay is building a larger, more modern airport but at the moment, it's pretty small. We stayed overnight at a nice B&B run by a local family and it was very pleasant - Omega B&B. They answered a lot of questions we had about the drive. We set off early the next morning, though in retrospect we should have left a bit earlier. Since we did not have a 4x4 vehicle, we weren't able to drive very fast even though the distance is not incredibly far. 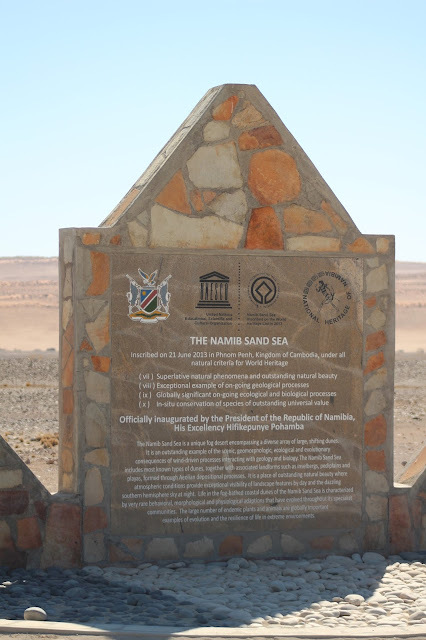 The paves road stops only a short distance outside of Walvis Bay and then it's basically gravel. The views from the road are spectacular. There are lots of Gemsbok (or Oryx) along the way. A typical rest stop looks like this, though not all have shade trees. As you travel further into the heart of the park, it's not only a beautiful landscape, it also changes. You may then continue driving for a few kilometers through gorgeous dunes to get to a carpark. You can then take a ride from a ranger for an additional small fee to get to Sossusvlei, I was told the ride took about 20 minutes, or you could hike down. Since the ride down took much longer than we expected, we did neither and hiked to Hidden Vlei instead, taking photos along the way. And before long, it was time to get back on the road as we knew it was going to take us as long to get back as it did to get there: about 4 and a half hours. ...time for a stop to fill up. 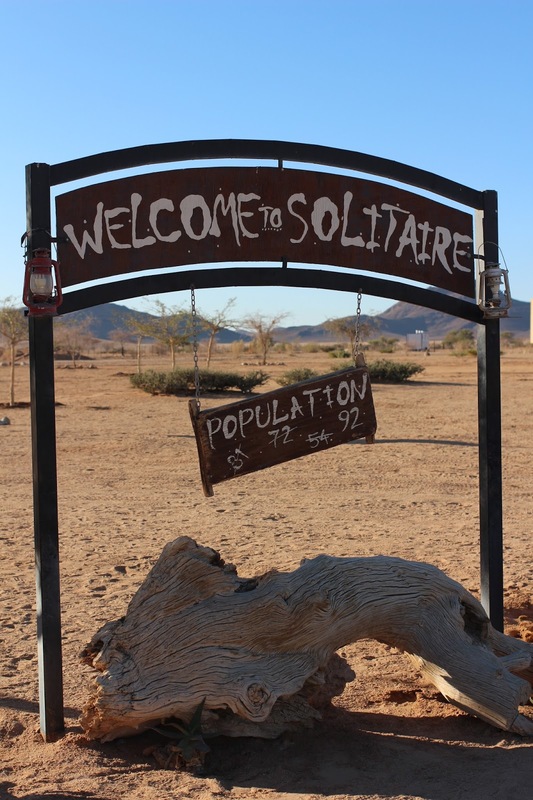 This was a very small town called Solitaire. Even though there's not a whole lot happening, it was an interesting looking place, and someone has staged some cool old rusted cars making for good photos. We continued on, and as night fell, we saw more animals. It was amazing to see a herd of wild zebras running near the road. A lovely sunset was a gorgeous end to a very memorable and wonderful day. 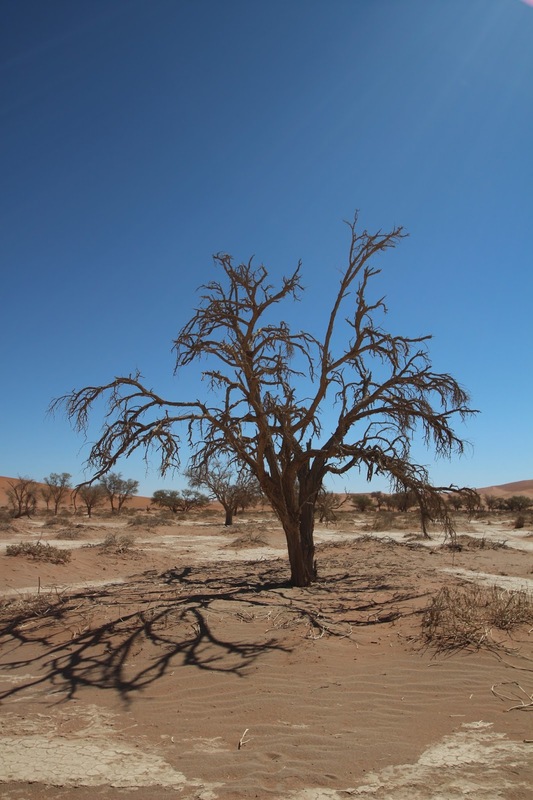 I'd like to return to Namibia and stay longer, and see more of the country, next time. The time was too short, but I'm so glad we went even for a short time for such an incredible experience.